This property is fully winterized, and contains a high-efficiency furnace for cold winter nights, as well as a gas stove-type furnace in the living room. We also have CENTRAL AIR to bring that added degree of relief on the hot days we get here in the summer. Usually tho, there is a refreshing breeze blowing from the lake and the cottage doors can be opened front to back, to allow good air flow and lets in the sweet sounds of nature. There are 2 ceiling fans - one in the kitchen and one in the master bedroom - as well as two other movable fans for spot-on comfort and better circulation if needed. A full four-piece bathtub/shower combo is available for you and many helpful items you will find in the cupboard: hair-dryer, hair-straightener, first-aid items, cotton balls, hydrogen peroxide, etc. Depending on the season, you are able to see more or less of Lake Erie - it is right in front of us, past the conservation park, and right behind our cottage. You can hear it all the time though! We do have full, refreshing central air-conditioning! Perfect comfort for the hot days of summer in Ontario. We have central heating, with high-efficiency gas furnace, along with central air-conditioning - essential for a four season cottage. If you are able to bring your own linens and towels, we will waive the 50. cleaning fee for your family. We provide plenty of pillows and blankets for your use. Although we do not supply a clothes dryer, we do have a full clothesline easily accessible to you just outside the back door. There is a lovely cast-iron gas fireplace in our cottage. There is easy parking for 3 vehicles, and room to park across the road, if need be. We do provide internet service to our guests. There are usage ceilings however to be further discussed with our guests upon booking. There are a limited number of towels provided, for use in-house only. Please bring your own beach towels. There is no dishwasher available. Full sized refrigerator/ freezer available. There is a microwave available. We have a coffee grinder available for your use and a Keurig coffee maker. If you like to make larger amounts, there is a coffee percolator available as well. You should find just what you need available for you. Full sized stove, microwave and all kitchen amenities available. The table in the kitchen folds out on both sides to easily seat 6 people in the kitchen. As well, the picnic table outside, with umbrella, seats 6-8 comfortably depending on size. We have an in-house antenna for our living room TV(dvd), which provides you with 27 channels. TV in bedroom 2, for use with X-Box entertainment. We have plenty of DVD's for your viewing pleasure. You will find books located in various cozy corners of the cottage. There are family board games and card games available for you inside the TV console in the living room. May be docked nearby. With one vehicle, there is room for a small boat to be parked at the Sweet Retreat. Full-size deck out back with furniture; and lovely veranda in the front is available for you, with two large-sized granny rocking chairs for use on the veranda. Long Beach Golf Club is available just minutes away. However... there are only a couple of stairs leading up the front veranda and a short lift into the cottage. As long as someone could help manage that, this cottage would be comfortable for someone in a wheelchair. You are located a short drive from all the attractions of the famed Niagara Region. A short drive from the Peace Bridge and Rainbow Bridge to access the USA (about 40 minutes from either). Niagara Falls with all its splendour is a 40 minute drive, Niagara-On-The Lake is 45 minutes, and many beautiful and scenic towns dotting this portion of Lake Ontario just minutes away - Dunnville, Lowbanks, Port Colboune, Crystal Beach, to name a few. 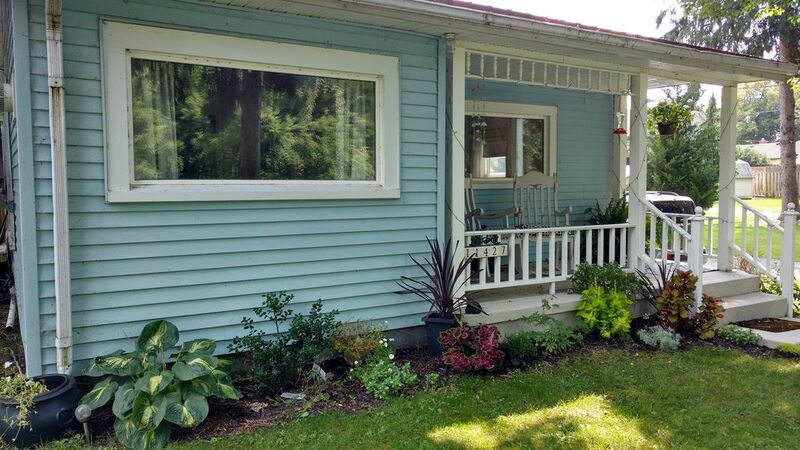 This cottage is located off a road that is found away from the busy Lakeshore Rd of these towns, giving it extra privacy and quiet during the busy summer. Perfect location, peaceful, serene and popular with photographers of all skill level for the beauty surrounding this location. Such a nice place to stay. You feel right at home, arriving at the house. Nice personal touch to the house. Loved to use the BBQ outside and sitting on the deck. Even you do not have a direct access to the lake, it is just a short walk down the road. Thank-you so much Harald and family. A pleasure to host you all! Highly recommend. One minute to the lake to walk through a nature reserve. Cosy house. Would come back any time. So glad to have met you, delighted you enjoyed your stay and we would love to host you and your family again any time! We had a lovely time at Lake Erie. The park with all the beautiful birds opposite to the house is fantastic. Kids loved it. Great hideout to explore all Niagara Falls area has to offer! So happy to hear you all had such a nice visit here! Safe travels home! Cozy and comfortable cottage made for a great sisters' getaway! Elizabeth and Brian were very welcoming and arrived to give us a tour of the property. Everything that we might need was there for us, including bottled water and coffee for the coffee maker. The cottage was a great base for our day trips around the local area. Evenings were relaxed and enjoyable with a glass of wine on the front porch in comfortable rocking chairs, listening to the rain or the sounds of the lake from across the road. The cottage easily accommodated all three of us and allowed us to enjoy our annual time away with each other. Thank you, Elizabeth and Brian, for a wonderful getaway! 'Hidden Gem' is the best way to describe the cottage! The location gives availability to the beautiful Conservation Area right across the street as well as easy access to the beaches at Morgan's Point. The cottage itself was warm and inviting with a real homey feeling to it. From the rocking chairs on the front porch to the loungong on the back deck it has everything you need for a comfortable and enjoyable stay on the shores of Lake Erie. A great place that I plan to return to!! Thank-you John, so happy you enjoyed your time at our sweet get-away and the beauty surrounding here :) Please be in touch again, we are available all four seasons! we had a great time! the cottage was extremely clean and had everything you could need. Short drive to beaches and quarry, restaurants and grocery stores. Huge park right across the road. Full side yard for outdoor games etc. A 2 minute walk to the rocky beach/lake. We will go back next year for sure. And the owner was there to greet us upon arrival, very nice and helpful and gets back to you right away if needed. Rates are subject to change until reservation is confirmed personally by the owner. Monthly off-season rate, Nov - May, is 2100.00 per month all inclusive. Must pay first and last month rent with accepted application, and reference check required.